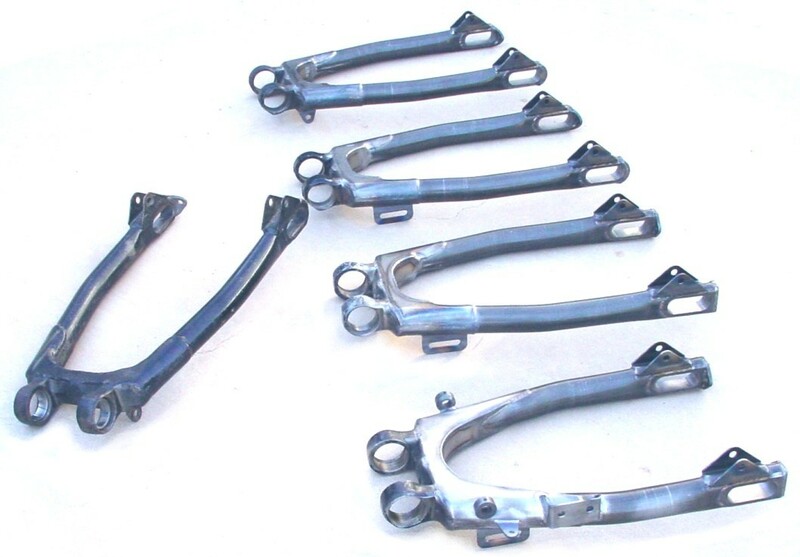 I have always felt that the XR swing arm could be a work of art if carefully fabricated. This page shows SOME of the steps and tools necessary to produce these sought after racing parts with the quality that the design deserves.  The view below is of the 4 different styles with an original early dirt track version on the left. 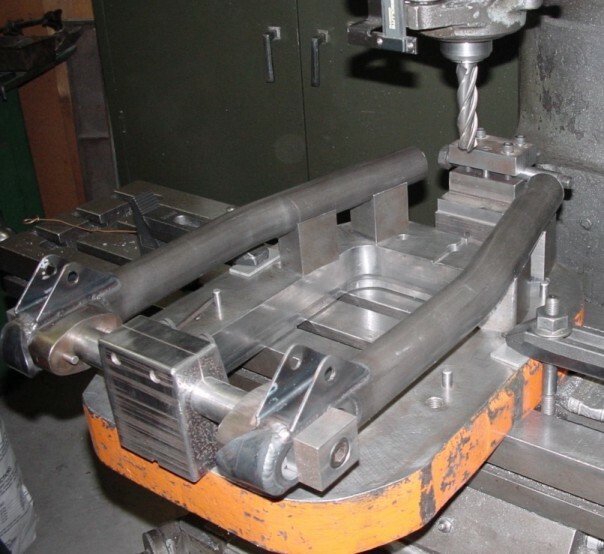 One of the first challenges to be met was the flattening of the 4130 Chrome Moly tubing for the axle area. The tube on the left shows what happened at first. Instead of becoming oval, the tube bent sharply at the edges creating long, fine cracks that don't quite show up here on the web. 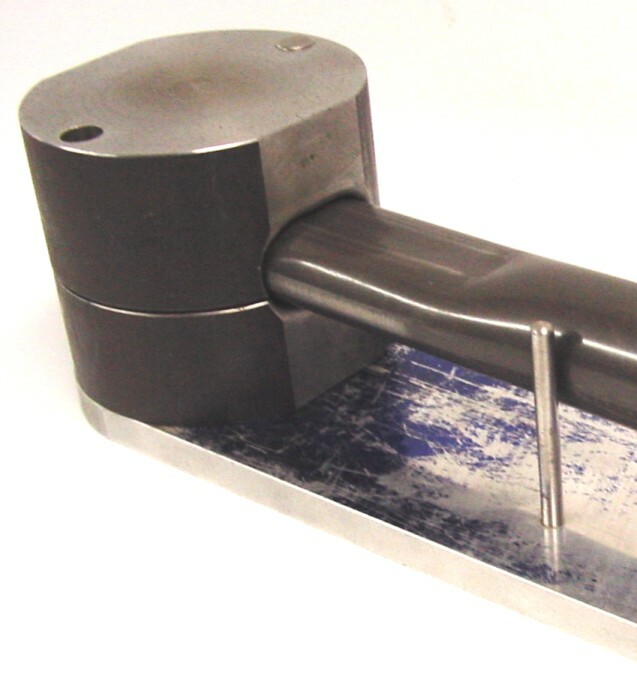 The machining/welding fixture pictured above is made from steel that is 2 inches thick. The top and bottom are precision ground flat and parallel. It is shown bolted into my engine stand to allow better access to all the welds. The axle inserts are now ready to be welded into the arms PRIOR to machining the axle slots. 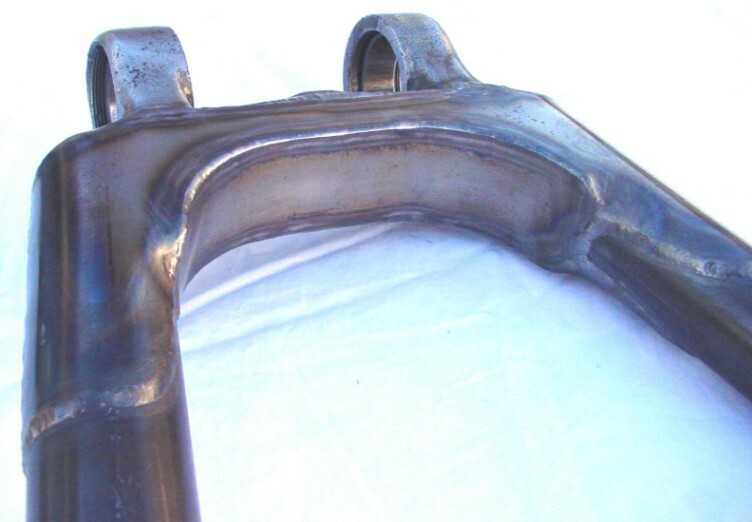 The original blueprints specified that these inserts were supplied by the factory to be welded in by the fabricator. 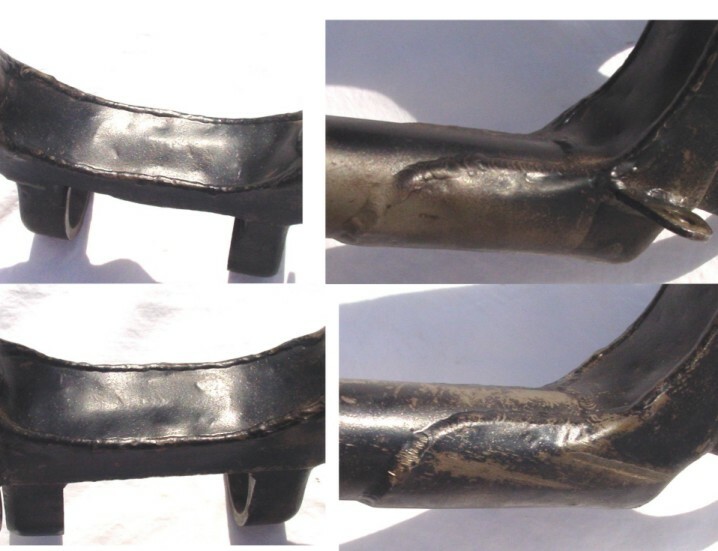 If done in this sequence, there is no way to prevent the welding process from distorting the machined axle holes. 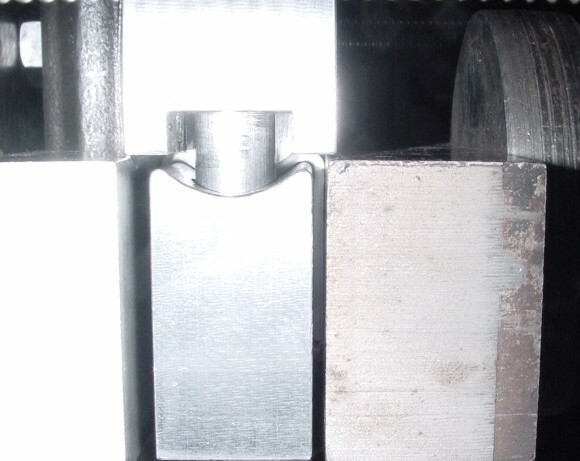 After making a special forming die to support the tube as it is flattened, the middle view on the left shows the deeply scored area from its first use. This required reworking the die to eliminate the digging action at the die edges. If too much metal was polished from the die at this step, it would lose it's ability to support the tube and the die would be useless. 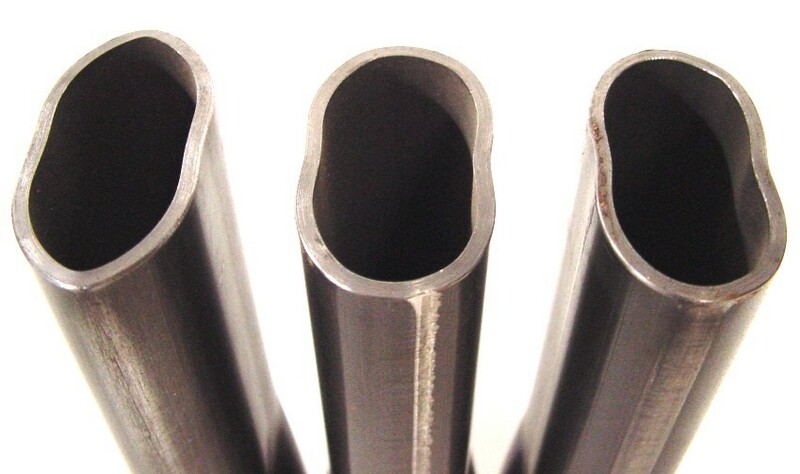 The right view shows how the tubes currently come out with only slight burnishing in this area. 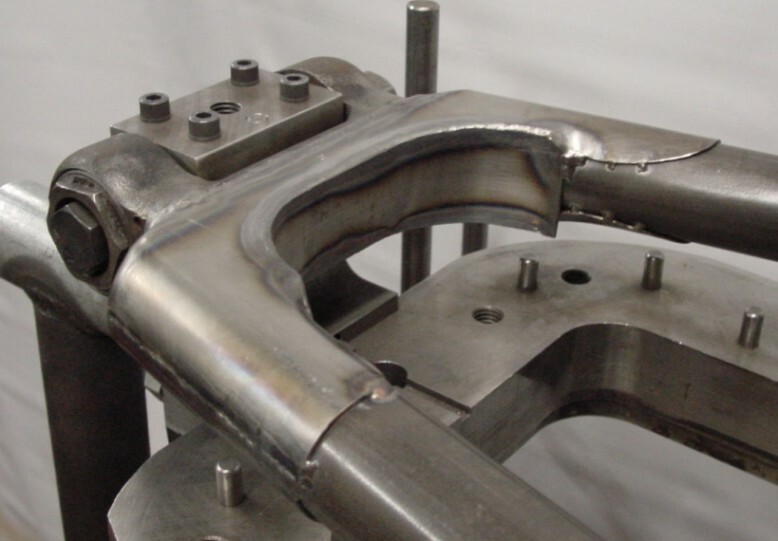 Below is a view of the completed forming die with the tube partly withdrawn to show the cavity more clearly. 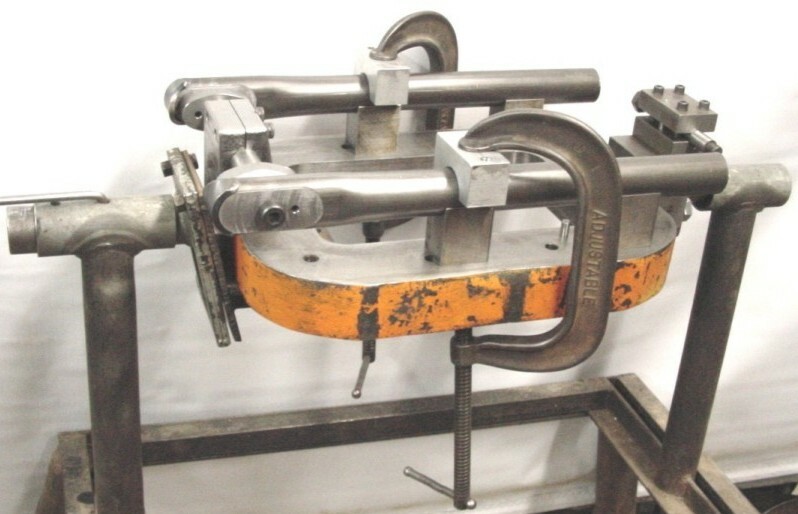 Below, the shock mounts are being formed with pressure being applied from the top and both sides as shown. Above left, the same fixture from the engine stand is setup in my milling machine ready to cut the front of the newly bent arms once they are clamped down. Notice that the axle slots and shock brackets are now finished also. Not one weld is made without being bolted into this fixture. No area is machined until all welding in that area is complete. Before this fixture comes out of the machine, I mill the front pivot forging to the blueprint dimension. Using the same setup this way assures parts that mate up tightly before welding, thus minimizing distortion. Below, the front pivot is now welded to the arms and the 4130 sheet gussets are being added. Notice how tightly they fit the round arms before welding and not hammered to fit as they are welded. Now compare the smooth finished surfaces of the completed arm on the right, which is also at the top of the page, to one of the original arms I have for repair below. The difference is in the time taken with each arm. I deliberately refrained from taking the easy, fast way out and did not hammer it together as the welding progressed. On this page I have tried to illustrate the type of care typical of each step required to make one of these swing arms. Commercially, I am foolish for spending the time I do. There weren't enough XR's built to ever allow me to recover all my time through the sale of these. But it all came down to one decision. Even if I found an original for my own project bike I knew it would require considerable time to bring it up to the standard I demanded. Ask yourself which arm would you be the most proud to have as part of your project and you will understand my decision to build these.